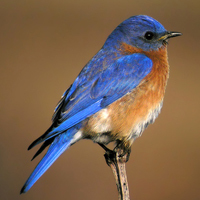 Attracting birds to your garden is as easy as planting shrubs that birds are drawn today. 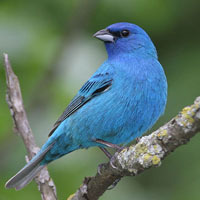 Attracting birds to your garden is as easy as planting shrubs that birds are drawn today. Lets look at just a few of the shrubs that will attract birds to your garden. Viburnums are the stalwart of any good shrub border and not surprisingly they are also equally important plants for creating good bird habitat. Viburnums provide everything from canopy that shelters the nests of smaller songbirds to a plethora of colored berries that birds love to feast upon. The fruit on Viburnum ranges in color from yellow, and pink, to red and blue with many aging to black. In zone 5 the fruit is on display from June with Viburnum ‘Shasta’ into January with Viburnum CARDINAL CANDY®. 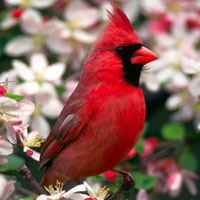 Cardinal Candy® is a great choice for a red fruit viburnum. For blue fruit try a variety like BLUE MUFFIN®. It is a wonderful plant with glossy foliage. Viburnums with stunning yellow fruit include Viburnum ‘Michael Dodge’ and V. opulus ‘Xanthocarpum’. This is but a brief list of the Viburnums that are excellent for attracting songbirds like the cardinal to your garden. Sambucus or Elderberries are a group of plants that are wonderful for birds. They flower in late spring and in summer are covered with large clusters of berries. Some varieties offer cutleaf foliage in greens and in golds like Sambucus ‘Sutherland Gold’. Then there are varieties that have dark purple foliage and fragrant pink flowers like Sambucus BLACK BEAUTY® or BLACK LACE®. The Ilex family is a group of plants that ties in perfectly with attracting birds. The added bonus is that with the festive red berries of Ilex also herald the impending arrival of the Christmas season.Try one of the evergreen hollies like Blue Princess. Birds love the protection that the foliage provides year around and the red berries make a wonderful accent during the fall and winter months. Some branches may even find their way onto your holiday table! Varieties like Berry Poppins®, Berry Nice®, Berry Heavy® or dwarf varieties like Little Goblin Red® are great for bird habitat and as a food supply. Imagine their brilliant red berries accenting some evergreens during the Christmas season. How many of you realize that Hummingbirds love the nectar provided by new Hibiscus syriacus varieties like Lavender & White Chiffon®, and older varieties like ‘Aphrodite’ and ‘Helene’. Hibiscus puts on a stunning flower show from mid-summer on. Add in Hibiscus moscheutos and you’ll have a stunning display of color. Lilacs are important because they provide nectar early in the season when there are limited food supplies for hummingbirds. 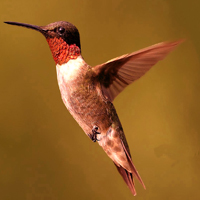 Hummingbirds love the nectar just as much as we love their intoxicating fragrance. This combination is all the more reason to set up a display especially near your nectar feeders. After all how many lilac blooms does it take to fill a room with fragrance. 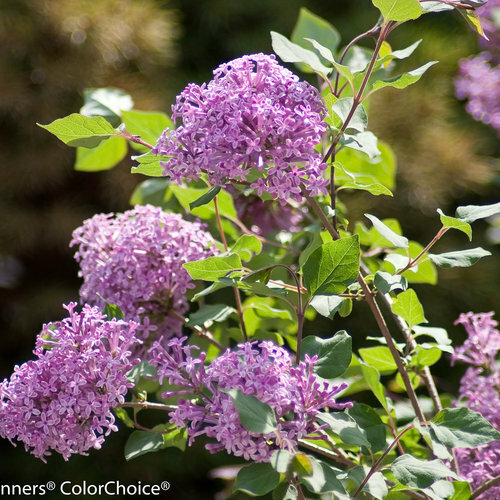 If you have a selection of early lilacs like Syringa hycinthiflora, along with French lilacs, Syringa vulgaris, and some late hybrid lilacs like Syringa prestonia you can actually have a display that is in flower for over four weeks instead of just two. Add Syringa x ‘Miss Kim’ which flowers after the late hybrids and now you have up to six weeks of flowers. The flowers of a Weigela with their trumpet shaped flowes are loved by hummingbirds. 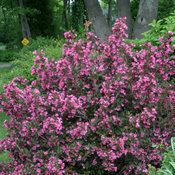 One of the best is Weigela ‘Red Prince’ which covers itself in a profusion of tubular blood red flowers in late spring. Even more impressive is Weigela WINE & ROSES® because it not only has rich fuschia-magenta flowers but the flowers are complimented by dark wine burgundy foliage. This combination of flowers and foliage makes Wine & Roses® attractive even when they are not in flower. There are many other varieties of Weigela that are available to fit smaller landscapes that are more compact in size reaching only four feet at maturity.